In our online store we work with privacy sensitive data or personal data. FairBoost recognizes the great importance of the careful handling of these personal data. Personal details will be handled and protected. We respect your right to have a look at your personal data in our system for inspection, to modify or delete. 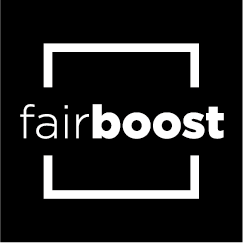 FairBoost is responsible for data processing. In this privacy statement, we explain what personal information we collect and use for what purpose. We recommend that you read this statement carefully. This privacy statement was last updated on 23-05-2018. Using our online store we obtain certain information from you. Probably also personal data. We will retain and use only the personal data provided specified by you, in the context of the service you have requested or for which is clear that they are provided to use in the process. When you place an order with us, we make use of your personal data. If it is needed for proper handling we may share your personal data with third parties. This is only for a correct and appropriate execution of your order. Your information will never be provided to or shared with third parties with other commercial purposes. By email via Mailchimp and Survey Monkey. In both cases, you can indicate that you do not want to receive these e-mails. We offer via our online store the opportunity to ask questions through a contact form, In this form you will be asked to fill in some personal data. You choose which data you provide. The data you submit to us, will be kept as long as to the nature of the form or the content of your email is necessary for full answering your question or complaint. We offer a newsletter through which we want to inform interested parties about our products and/our services. You can sign up for this newsletter. Every newsletter contains a link that allows you to unsubscribe. We don’t publish any customer data. Our online store shows no ads. We can provide your information to our partners. These partners are involved in the implementation of the agreement. This information will not be used for other commercial activities. We don’t use Google Analytics to track how visitors use our Web store. We take security measures to prevent misuse of and unauthorized access to personal data. The above described personal data will be retained for as long as necessary to handle your order. And to be of service to you in case of repeat purchases in our Web shop for another or next event. The information is then erased, unless there is a legal duty is that of preservation required (such as the fiscal data retention of 7 years for payment data). This privacy statement does not apply to third party websites through links with our online store. We cannot guarantee that these third parties handle your personal data on a reliable and safe way. We recommend that you read the privacy statement of these sites before making use of these websites. It is recommended that you consult this privacy statement on a regular base, in this case you are aware of these changes. You can also submit a request to a data export to poll data that we use. To prevent abuse, we can ask you to adequately identify you. When it comes to access to personal information linked to a cookie, you will nee a copy of the cookie in question. You can find this in the settings of your browser. If the details are incorrect, you can ask us to modify the data or change or withdraw. We will be happy to help you with any questions or complaints regarding the processing of your personal data. On the basis of the privacy legislation you also have the right to complain to the Authority Personal Data regarding the processing of personal data.